Inspiration in the woods is the foundation of this beautiful editorial. That truth shines through the rich tones and vibrant colours of this woodsy wedding. So we follow the gorgeous bride ‘into the woods’ where we find sweet smelling candles, stylish cocktails, one of a kind jewellery, overgrown bouquets, delicious edibles and an organic cake! We love so many things about this inspiration editorial! The colour palette is highlighted even in the charcuterie board and gin bar. Even more impressive was the attention to scent which is something that is often overlooked. Between the fresh eucalyptus in the bouquet and the glowing amber colored candles from 341 Candle Co, scented with bergamont, cedar and spruce, the forest was smelling even more amazing than it already does naturally. 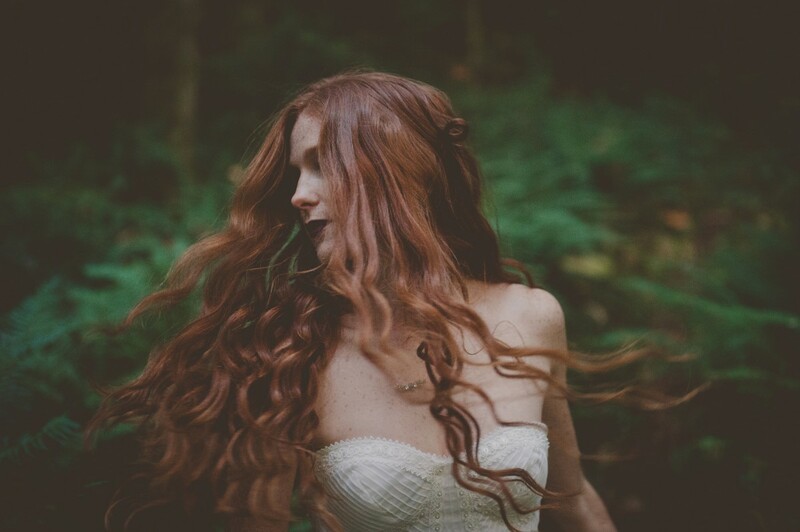 Of course, the showstopper is the bride with her crown of flowing red locks! Her hair is perfectly showcased by the detailed, yet simplistic, feel to her gown and sumptuous flowers. The bridesmaids are perfect in their beauty surrounded by the serenity of the woods. Of course, the showstopper is the bride with her crown of flowing red locks! The design team behind this inspirational shoot assured us that they had fun creating and shaking up signature cocktail right on set, a Rosemary Gimlet. Not only did it taste amazing with the Ampersand Gin but it fit perfectly with the woodsy theme. The one of a kind jewellery worn by the bride was a find through happenstance of a Ucluelet shop. The jewellery designer was more than happy to come up with pieces just for this shoot in the perfect emerald green colour. We were really impressed with the attention to local talent and creations that were showcased in this editorial – shop local and look at the beauty you can enjoy! This creative shoot concentrated, not only on local, but on organic and vegan. The cuisine is actually completely vegan, the cake is all organic ingredients and the flowers are sourced locally! You can recreate easily by looking for local talent who are as devoted to these ideals as you.